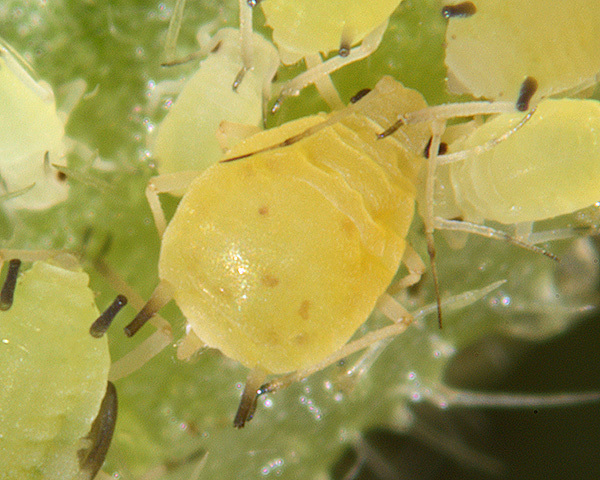 Adult apterae of Aphis ochropus are yellow, yellowish-green or greenish yellow. The terminal process of antennal segment VI is 2.9-3.7 times the length of the base of that segment. The fused terminal segments of the rostrum (RIV+V) are 1.4-1.8 times the length of the second hind tarsal segment (HTII).The siphunculi are dark and are 2.00-2.86 times the length of the cauda. The cauda is pale (although in some of our specimens it appears dusky) with 7 hairs. 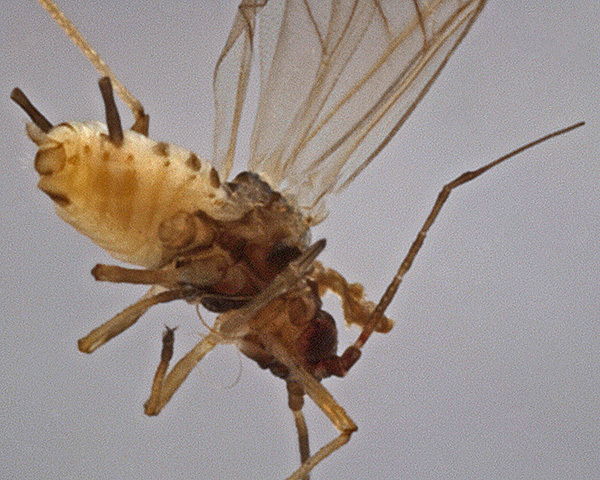 The body length of the aptera of Aphis ochropus is 1.2-2.0 mm. 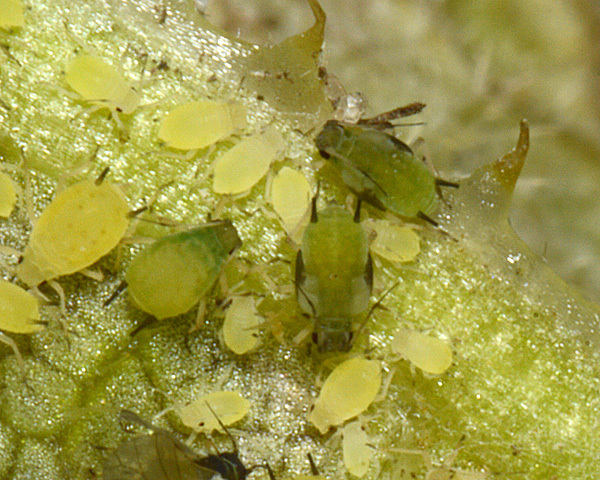 Alates of Aphis ochropus have 10-11 secondary rhinaria on the third antennal segment, and 2-3 rhinaria on the fourth segment. 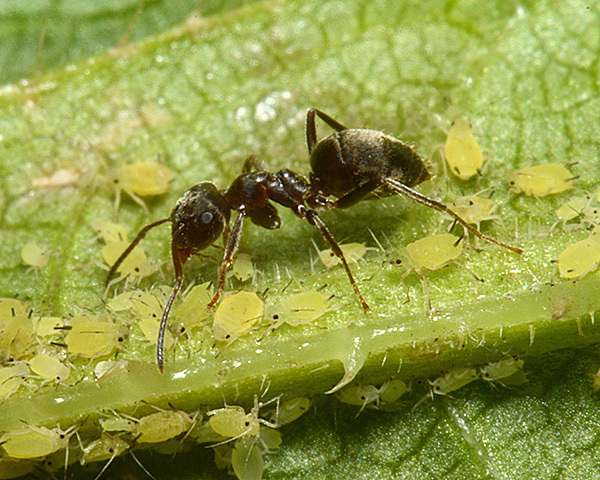 The yellow teasel aphid does not host alternate. 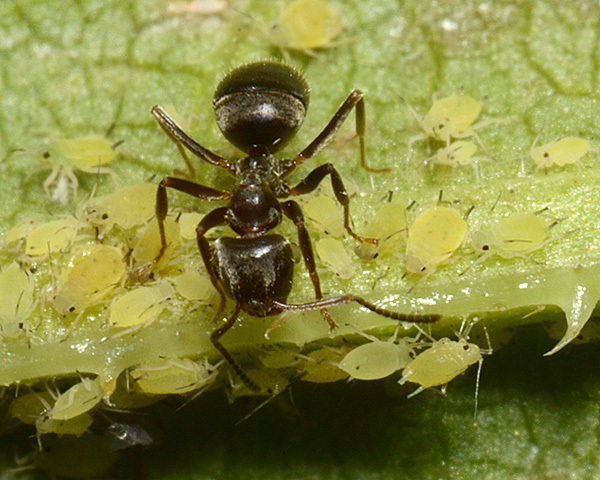 Aphis ochropus feeds on the basal leaflets and subterranean parts of teasel (Dipsacus sylvestris). It is attended by ants usually Lasius species. The species was first recorded in Britain in south Wales in 2009. Our observations on Aphis ochropus constitute the second record of Aphis ochropus in Britain and the first in England to date. Baker (2009) found the species in Britain for the first time in Wales in 2007. He thought it likely that plants growing at sites with free draining soils and high exposure to sunlight were favoured. In Sussex we found the species on teasel growing in similar habitats - namely on salt marsh (Rye Harbour) or shingle beach (Winchelsea Beach). Their colour variability is well demonstrated in the picture below. Of the two apterae in the picture (centre left), one is yellow and the other is yellowish with a greenish suffusion over the thorax and anterior of the abdomen. 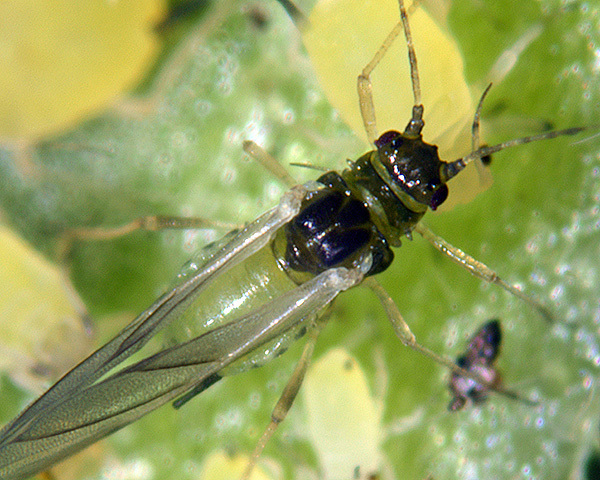 The picture above also shows two immature alates. They are greenish with conspicuous black-bordered wing buds. We found Aphis ochropus usually attended by ants. The colony at Rye Harbour was attended by Lasius niger (see pictures below), and there was evidence of past attendance (soil tenting) at Winchelsea Beach. Baker (2009) thought that the species was most likely an obligate myrmecophile, since it has not been observed without ants. So far in Britain, Lasius niger is the only species of ant observed in attendance. Blackman & Eastop list 8 species of aphid as feeding on teasel (Dipsacus sylvestris, Dipsacus fullonum) worldwide, and provide formal identification keys. 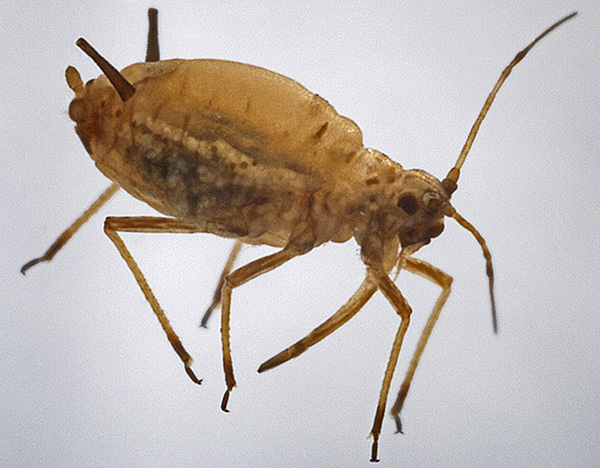 Of those aphid species, Baker (2015) lists 7 as occurring in Britain: Aphis confusa, Aphis fabae, Aphis ochropus, Aphis solanella, Macrosiphum euphorbiae, Macrosiphum rosae and Myzus persicae.